This would be recipe #2 from my vegetable cooking binge. Remember when I said that I didn’t usually like winter squash unless it was pureed or on a pizza? Well, I was wrong. I should have known that I would also enjoy it simmered in brown butter. Because what isn’t delicious when simmered in brown butter? Exactly. Apparently, we are going to have a very healthy Thanksgiving dinner this year, because I’m already up to three vegetable side dishes that I want to serve, and still have ideas for more! But that’s okay. Dan’s birthday falls on Thanksgiving this year. And eating more vegetables (many, many more) at Thanksgiving dinner means we can have both pie and birthday cake, right? Right. Now I just need to come up with a cake that also fits into the Thanksgiving meal. It is probably safe to say that any vegetable cooked in brown butter will be delicious, and butternut squash is no exception. This is another dish that may very well be making an appearance on our Thanksgiving table. Brown the butter. In a small saucepan over low heat, melt the butter. Continue to cook, stirring often, until the butter is a dark gold/light brown. Remove from heat and stir in the sage and oregano. Add the squash to the pan and stir to completely coat the squash with the brown butter. Cover and return the pan to the burner. Simmer over medium-low for 10-15 minutes, or until the squash is fork-tender. Serve. 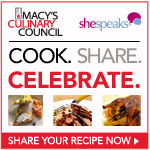 This recipe has been entered in the Macy’s Recipe Share Contest. I was compensated for this post bySheSpeaks, but all opinions regarding the contest are my own. do you have any hints for peeling butternut squash? I dread it! But I have risotto recipe that is calling my name (butternut squash, leeks & basil are main components). Oh: and what about Pumpkin Cake? I have an amazing recipe I’ve been wanting to try! I’m actually experimenting with a pumpkin cake recipe right now…just haven’t gotten it quite right yet. I use one of the y-shaped vegetable peelers to peel butternut squash. It is a lot faster than cutting it off with a knife, and it doesn’t take off as much of the squash itself! I love buttercup squash and hate peeling it… I learned a few yrs ago that if you put the whole squash into your microwave for 5-10 minutes depending on the size, then remove and let cool down it peels real easy! Ooh, that looks like a Thanksgiving side dish in waiting! yeah to brown butter! i’ve been using it in everything lately. I’ve noticed. 🙂 And that’s because it’s awesome.